Spread the word—and your business—with our online flyer printing services. Printed on Aqueous coated 100 lb Gloss Book and available in three different sizes, our flyers are the perfect high volume solution for advertising special events or your company’s biggest sales. 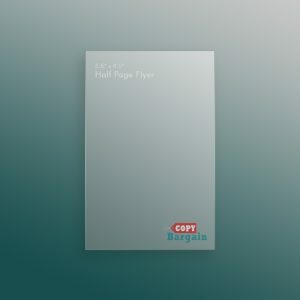 With quarter pages covering 5.5”x4.25”, half pages filling 5.5”x8.5”, and full size pages spanning 11”x8.5”, we give you all the space you need, ensuring that your potential clients don’t miss out on a single thing. 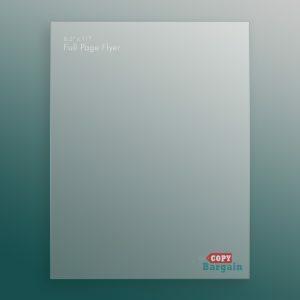 Up the ante by printing your flyers with Copy Bargain’s online printing services. With our professional print products and design services, we are guaranteed to take you from novice to professional with just a few clicks of a button. These days, paper marketing is an often forgotten, but powerful tool for getting your brand out there. Our flyer printing services are the best option for breaking the mold and creating a lasting impression with potential clients. By making the move to order online, you’ll be equipped for every networking, casual, or sales event that’s thrown your way. Don’t be forgotten by those that matter—instead, keep your company’s arsenal packed with all of the marketing supplies you could ever need. When it comes to your business, you want to print with someone you can trust. Let Copy Bargain be those people for you. We offer only the best in customer service, fair prices, and made-to-order printing, bringing you high quality print services to help grow your business. We’re a group of marketing pros who know just how important paper advertising can be for a company’s brand. Need help choosing between the quarter, half, or full page flyers? No problem! We’re here to help. Not only will we help you get just what you want, we’ll go the extra mile and make sure that you get just what you need. Whether you need assistance deciding what kind of print material is right for you, or you’re craving the benefits of a professionally designed logo, we’ve got you covered. 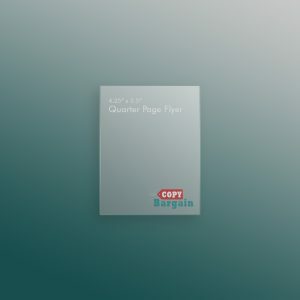 At Copy Bargain we always promise great prices, excellent customer service, and a wide range of print options to choose from—guaranteed.